Didn't think watching the #PrezRezVisit would be so funny. youtube.com/watch?v=qvJn0c…. At #PrezRezVisit . Asks Secret Serv why dress in black? 'Oh no they can't answer some1 will tell the President"
President OBAMA is about enter... tune in! Loving all the #PrezRezVisit tweets. I'm all the way in Mexico, and I'm cracking up! 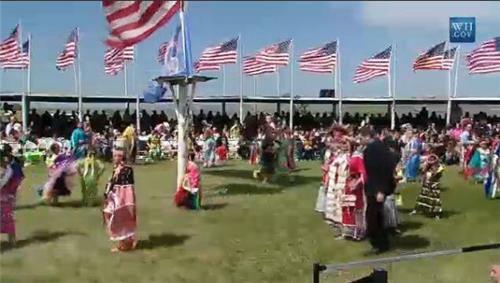 I could listen MC for #PrezRezVisit all day, headphones on, splitting a gut, trying to focus on work is difficult. Wonder what these Secret Service peeps r thinking w/ the announcer? Seems like this might be outside daily routine a bit. Not a single one of these politicians would ever go to cannon ball, not even the ones from this state! Just showing off! Some of the jokes... oh goodness! #PrezRezVisit Should i laugh?! Did he really just mention Iraq? #PrezRezVisit ??? ?